Measurement matters now more than ever. Marketing technology advances have made it easier and more affordable to connect activities to outcomes, but marketers are largely dropping the ball when it comes to monitoring, reporting, and improving performance. Adobe’s Digital Distress study, which surveyed more than 1,000 marketers, found 76 percent of marketers believe measurement is important, though only 29 percent believe they are doing it well. Meanwhile, the Chief Marketing Council reported in its More Gain, Less Strain study that 71 percent of clients cited accountability as their main area of frustration with agencies, and 52 percent of marketers don’t have a formal scorecard for rating agency performance. So while content marketers understand the importance of measuring marketing effectiveness and shifting resources and priorities based on performance, they often lack the fundamental tools, knowledge, and processes to take action. As the industry evolves, opportunities are emerging for savvy marketers who can effectively assess their marketing foundation, keep score of what matters, and adapt strategies based on performance. Organizational assessment: Every marketing plan should start with an honest internal assessment of your foundation, platform, expectations, and potential. Foundation: What is the strength of your existing website, content asset library, brand, business model, marketing technology, team, and processes? How much building work needs to be done? Platform: How extensive is your reach and influence among key audiences, such as customers, leads, partners, peers, media, and employees? Will you have to rely on paid media to get your content seen, or do you have established, captive audiences who will engage with and share your content? Expectations: What are your business’ priority needs and goals, and how do they align with your available talent, technologies, and resources? Are your expectations for growth realistic? Potential: What is the potential for short- and long-term success based on existing assets and the effort required to improve areas of weakness? What you’re looking for are gaps in perception and performance — areas where your organizational goals are unlikely to be met by your current infrastructure, assets, or processes. By involving multiple internal stakeholders in this evaluation process, you’ll be able to create a clear, well-rounded view of where your organization stands, and what work needs to be done to increase your potential for success. Strategic assessment: The assessment exercise also helps your organization to devise integrated marketing strategies; select the right marketing agency partners; allocate time, money, and talent; and adapt resources and priorities. To make this assessment easier to manage, you can use an online survey tool, such as SurveyMonkey, or you can register for tools like Marketing Score (full disclosure: Marketing Score is a product offered by my company, PR 20/20). Does your organization have and use core content marketing technology solutions, including content management system (CMS), customer relationship management (CRM), email marketing, marketing analytics, and project management? Are these technologies integrated, or are they siloed solutions that might be creating inefficiencies? Is your organization generating sales opportunities from a diverse set of lead sources, including blogging, content downloads, email marketing, events, inbound phone calls, and organic search? If not, how can your content marketing strategy improve the volume and quality of inbound leads from your various channels? How does your organization rate in key performance metrics, such as cost-of-customer-acquisition (COCA), lead volume, lead quality scores, lead-to-sale conversion rates, social reach, subscribers, and website traffic? How can content marketing strengthen performance throughout the marketing funnel? Is your marketing team structured to excel in content marketing? Consider your organization’s competencies in copywriting, data analysis, email marketing, lead management/nurturing, search engine optimization, strategic planning, and video production/editing. If your internal team lacks capabilities or capacities to produce certain core materials, how will you ramp up content marketing efforts moving forward? How strong is your organization at creating and distributing digital content assets that will meet your audience’s needs throughout their customer journey, including blog posts, case studies, eBooks, email newsletters, infographics, landing pages, mobile apps, and videos? Once you’ve conducted an assessment, it’s time to construct your marketing scorecard to monitor and manage performance. Dashboards for measuring marketing effectiveness are simple to build, and are becoming increasingly efficient to maintain. While there are technology solutions that offer robust reporting and visualizations, for many businesses, a straightforward Excel document or Google Drive Spreadsheet will suffice. The key is to clearly define your key performance indicators (KPIs) and goals; have a logical and well-documented process for updating and reporting results; and develop systems for turning data into intelligence — and intelligence into action. 1. Identify top KPIs: What are the 5 to 10 most important metrics to your business? These metrics should be tied directly to business goals, and all content marketing activities must be designed around achieving them. For example, for a B2B software company, the top KPIs might be website visitors, content downloads, webinar registrations, sales qualified leads, demo requests, free trial sign-ups, customer wins, churn rate, and recurring revenue. Get buy-in from all relevant stakeholders on your top KPIs, as they will be core to your strategy and performance reports, moving forward. 2. 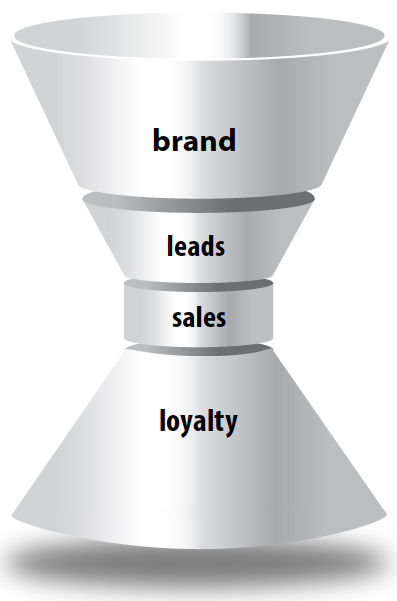 Customize your funnel: If you think of marketing like a funnel or, more specifically, an hourglass, there are four sections —brand, leads, sales, and loyalty. Select one prime goal (e.g., brand = visitors, leads = sales qualified leads, sales = new customer conversions, loyalty = recurring revenue) and up to 10 supporting metrics for each funnel section (total of four prime goals and up to 40 supporting metrics). Your top KPIs from Step 1 are a great starting point. At the top of the hourglass, companies look to build their brand, attracting website visitors, blog subscribers, and social followers — basically building their reach. From there, use content, such as blog posts, eBooks and webinars, to move audiences through the funnel and turn qualified visitors into leads. Once lead contact information has been gathered, leverage email marketing and other activities to provide as much value, and as personalized of an experience, as possible. The goal at this stage is to convert qualified leads into sales. Finally, at the bottom of the funnel, conduct campaigns to increase customer loyalty, driving more sales, more referrals and more profits. 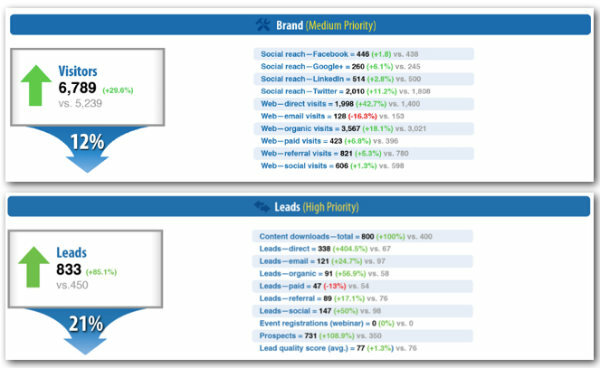 Sample prime goals (left) and supporting metrics (right) for brand and leads sections of the funnel. 3. Input and analyze data: You’ll want to input a minimum of three months of historical performance data into your scorecard in order to determine preliminary benchmarks, but 12 months of data is ideal. 4. Establish benchmarks and prime goals: Once you have a representative sample of historical data in your scorecard, you can define benchmarks and goals. Rather than trying to set values for every marketing metric, focus on the four prime goals you defined in Step 2 above. 5. Update and integrate the scorecard: Monitor performance daily using your go-to tools, such as Google Analytics, and populate your scorecard spreadsheet monthly with the previous month’s results. Use scorecard data to build more visually engaging monthly reports for the management team. We like to use Keynote (since we’re Mac fanatics), but PowerPoint and Google Drive Presentation work too. Construct content strategies that align with top KPIs. Monitor analytics to deliver real-time insight. Conduct monthly scorecard reviews with internal stakeholders. Adjust campaigns based on performance. Challenge yourself and your organization to become more metrics driven. Start with a marketing assessment to determine your current strengths and weaknesses, and then develop a marketing scorecard to monitor performance and inspire a more agile approach to content marketing strategy. How is your organization reporting marketing performance? What steps are you taking to evolve? Want more tips for measuring the effectiveness of your content marketing strategy? Access to Paul Roetzer’s full presentation from Content Marketing World 2013 is available through our Video on Demand portal. Paul Roetzer is founder and CEO of PR 20/20, a Cleveland-based content marketing agency and HubSpot’s first Agency Partner. He is author of The Marketing Performance Blueprint (Wiley, 2014) and The Marketing Agency Blueprint (Wiley, 2012); creator of the Marketing Artificial Intelligence Institute and Marketing Score; a regular contributor to leading marketing industry blogs; and a frequent speaker on marketing talent, technology, strategy and performance. Follow him on Twitter @paulroetzer.